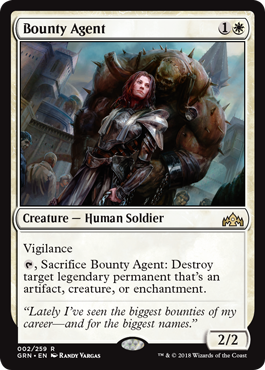 With nothing else to pop, Bounty Agent is a 2/2 for 2 with vigilance, a decent rate of return (though very unspectacular and unlikely to make waves in any format). Worst-case scenario is a passable creature, but what we care about is its best-case, right? Its best-case is that it can trade with a legendary artifact, creature, or enchantment, which probably is where the vigilance more comes in handy! You can attack in with this and still have the ability to blow up something problematic afterwards. For the most part, Guilds of Ravnica is light on legendary permanents that are not creatures, but Ixalan and Dominaria are less light on them (Ixalan block has the enchantments that flip into lands, while Dominaria just has a surfeit of legendary things across the board). Bounty Agent is not good enough to be a mainboard inclusion unless the meta favors decks built around legendary permanents you need to pop on the spot. But it’s a great sideboard silver bullet that can occasionally bring down a major target. I’ve often celebrated creatures with abilities that mimicked spells or continuous effects – and we wouldn’t have had Theros without that line of design – but putting Vindicate on a creature is a little much. To be fair, it’s a more limited version of Vindicate, and doesn’t one-shot planeswalkers (its ability to attack helps with that end), so it’s unlikely to get out of control. It’s much more of a threat and a much more versatile answer in casual formats – plenty of people made legendary/historic “tribal” decks after Dominaria came out, Captain Sisay is a popular commander and has to watch out for this card taking down its tutor targets, and I’d be looking at it as a possible reason to add white in Leyline of Singularity decks.